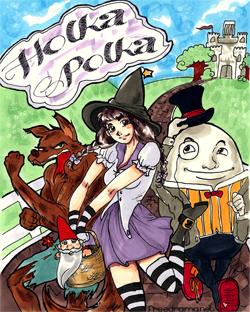 BRENDA: A young good witch who is given the quest to save fairytale land. WOLF: A misunderstood wolf who helps out BRENDA on her quest. CINDY: A princess who has been tricked into thinking she is ugly. HUMPTY: Humphrey Dumpty who pretends to be a mild mannered servant who is in reality a someone in disguise. SPLENDA: The good witch of the South and BRENDA's mother. DEZI: CINDY's other evil sister. FGM: The Fairy Godmother who has an evil plan. PINOCCHIO: A servant of the PRINCE who is wooden boy with a nose that hurts. PRINCE: He is a handsome guy who has been put under a sleep spell by someone. SNORZ: An Itallian wizard with the power to make someone sleep and is really the Fairy Godfather in disguise. HILDA: The head witch who wants to save the magic in fairytale land. GANDOLT: A wise wizard who wants to help save magic. SWEET: A witch who is the sister of the witch who had a run in with Hansel and Gretel. INKANTADORA: A witch who sees the bad side to everything. ZOOM: A witch who can't stop talking and gets turned into a toad. Additional WITCHES may also be added to the opening scene. If more speaking roles are desired the parts of ZORKA and INKANTADORA can't be split up into more WITCHES. Once upon a time in Fairytale Land.